Camu camu berry has a long history of indigenous use and incredible benefits verified by science. It is a small red South American super-berry that grows wild along the rivers of the Amazon rainforest. Camu camu berry is a natural plant source of vitamin C, stress defense neurotransmitter GABA and is a powerful antioxidant. It takes 30 kilos of fresh camu camu berries to make 1 kilo of Soaring Free Superfoods? 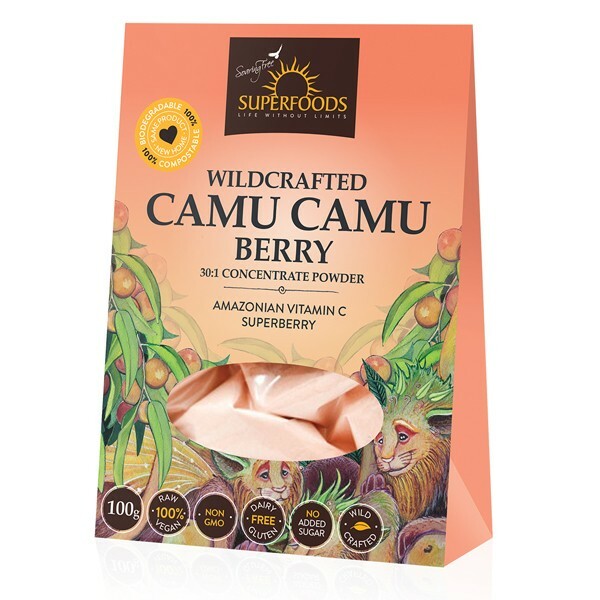 camu camu berry 30:1 concentrate powder. 100% Raw whole food powder produced using no heat, radiation, binders, fillers or excipients, providing you with the highest vitamin C concentrate powder available.